Why it’s daunting: During the most recent season of The Walking Dead, the episode “Still” ended with a haunting musical refrain that spoke both to the episode’s deeper themes of the characters’ troubled pasts and the fact that the show is set in a zombie apocalypse. “There’s gonna be a party when the wolf comes home,” sang a male voice over images of the characters setting a house on fire. Social media lit up with questions about what that closing song, with its references to Rome being founded by two men raised by a wolf and some unspecific tragedy in the singer’s past, could possibly be. The song was “Up The Wolves,” and it was likely the first exposure many in the show’s audience had to the music of the indie-folk rock band The Mountain Goats, which has been, at various times, a one-man singer-songwriter project, a loose collection of collaborators, and a trio. The only constant has been John Darnielle, the songwriter for the project and the central figure in all the following incarnations of the band. When Darnielle started The Mountain Goats, he wrote and recorded songs, in low fidelity, into a boom box, then released them on a variety of formats and labels. The first proper Mountain Goats release (a cassette-only album titled Taboo VI: The Homecoming) arrived in 1991, while Darnielle was working as a psychiatric nurse in Norwalk, California, and attending Pitzer College. News of his project slowly spread, and his first proper studio album, Zopilote Machine, arrived in 1994. (It was reissued in 2005.) As such, The Mountain Goats has a rich body of work extending beyond its 14 studio albums (which, to be fair, often collected material from the earlier cassette releases). What’s more, the band’s recording career splits into two distinct eras—the low-fidelity years, stretching from Zopilote to 2002’s All Hail West Texas, and the years of more traditional production quality, from 2002’s Tallahassee to the present. The chief attraction of The Mountain Goats, then, has always been Darnielle, and no matter the considerable musical talents of his collaborators—who have included, at various times, such figures as Peter Hughes, Jon Wurster, John Vanderslice, and Rachel Ware, among others—it’s often Darnielle’s lyrics that prove the major draw for the band. Erudite, literary, and often witty, his words are as likely to bounce between obscure mythological or Biblical references and off-the-cuff jokes as they are to relate some heartbreaking anecdote from his own (or an imagined) past. Darnielle’s songs very often take place among the downtrodden and desperate, but they also hold open the possibility of mercy and grace, of a potential for escape or transcendence. He writes honestly and brutally about human relationships, often ones in crisis, but there’s always a slim glimmer of hope somewhere within his work. But that also means there’s a lot of Mountain Goats—in a variety of moods—for the new listener to get through. As the band embarks on a short summer tour, there’s no better time to get into it and its vast, often starkly beautiful discography. There’s good reason for Sunset Tree to have been the album that got so many fans into the group. Darnielle’s songs had always tended toward literary motifs, establishing characters and images in the way a skilled short-story author might. (In fact, his first novel comes out this fall.) But he largely shied away from direct autobiography in the material released before 2004’s We Shall All Be Healed (which dealt frankly with addiction and addicts) and this release. Sunset Tree deals, in particular, with Darnielle’s childhood, spent with an abusive stepfather, and while not every song directly addresses this subject matter, the monstrous figure haunts all of the album’s songs (which include “Up The Wolves”). Darnielle fantasizes about getting revenge on his stepfather, but the album concludes less with the kind of hopefulness the band occasionally looks at but more with a sense of release. Darnielle lived in that house, but he survived and escaped. And, ultimately, he outlived the man who caused him such pain. It’s somber but thoughtful—two adjectives that describe much of the band’s best work. 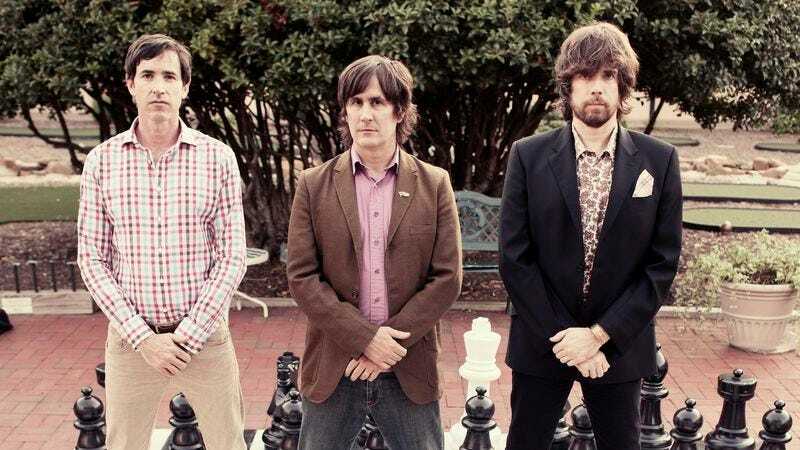 It sometimes seems as if The Mountain Goats’ longer-term fan base looks down slightly on those who’ve been with the band only since Sunset Tree, but that shouldn’t stop newbies from diving in here. In terms of strictly working as an album with a theme and a through-line, rather than just a collection of songs, Sunset Tree is likely The Mountain Goats’ best singular work, and even if there are albums that are just as strong (if not stronger) in the band’s discography, this one works well as a touchstone of sorts. Just don’t stop here, and you’ll be fine. Tallahassee, meanwhile, immediately announces itself as the band’s first more polished recording, with the sound of a brooding guitar marking time on the album’s title track. Many of Darnielle’s earlier releases had toyed around with a central couple called the Alpha Couple, and Tallahassee told an entire story about them—and the crash-and-burn that was their marriage. It’s an occasionally heartbreaking, occasionally gleeful look at two people who are absolutely awful for each other but see no way to escape their death spiral. It also features the other candidate for “most famous Mountain Goats song” in fan favorite and concert staple “No Children,” the most cheerful song you’ll ever hear about two people who would kill each other if they could just work up the energy to do it. From there, it’s best to move in both directions at once, seeking out both the band’s newer work and Darnielle’s older, less polished recordings. In the former category, start by looking at We Shall All Be Healed, which is not as cohesive as either Tallahassee or Sunset Tree but is often achingly real, and 2009’s The Life Of The World To Come, another loose concept album where every song title is a Bible verse. If you’re in the mood for something more low-fidelity, head back past West Texas toward 1999’s Ghana, which collects much of the best material from the cassette-only days, and 2000’s The Coroner’s Gambit, an important evolutionary step for Darnielle toward the relatively more polished sound of later releases. It also features “Elijah,” as perfect an example of how well hewn his lyrics can be as you’ll find. Where not to start: Darnielle himself would tell you not to jump right into Taboo VI. It’s not terrible or anything, but it’s also not of a piece with the band’s later music—even the other cassette releases that followed it. Plus, you’ll likely pay through the nose for a copy of it. Better to just seek it out on YouTube as a curiosity.